This blog follows the random musings of a 30-something woman trying to live my best life. Nothing's off topic here, so expect everything from parenting to gardening to politics to local, organic, vegetarian, and "ethicurean" cooking. As I go, I'll try to express the belief that we can each make a real difference in the world. I am a woman working to live my best life in a new home in the northern Midwest. On the edge of a small town, with two wonderful kids and a husband to match, I am able to put much of my time into creating our family's life. My interests include mindfulness, yoga, local food, vegetarianism, cooking, and wellness. I was very excited to discover a new denim brand that focuses not only on sustainable fibers but also sustainable dyes. I first heard about the denim on Facebook when a friend posted about how incredibly comfortable the jeans were. I'm always on the lookout for eco-friendly fashion so I started doing some digging. I was impressed to learn that the yarn that M2F produces for their fabric is OKO-TEX certified. At first I was a bit hesitant about M2F's approach to color. 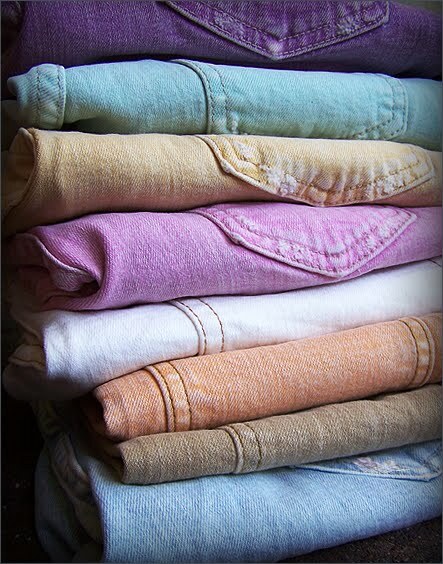 Their dyes are completely non-toxic and use 50% less energy and water than standard denim dye processes. The dye process is designed to create an authentic saturated color. The colors in M2F's denim range from soft pastels to deep jewel tones. The more I looked, the more I warmed to the uniquely colored jeans. After all, I'm always envying my daughter's bright, bold colored clothing. I opted for a couple of skinny pairs from the previous collection, one in earthy Greek Olive, another in Purple Haze. They are wonderfully soft jeans with a hint of stretch. Not too low cut, they are a true skinny jean, fitting almost like a legging. My previous jean colors have delved only into black, brown, and traditional indigo. These colors are deliciously fun. Both the olive and the purple are deeply saturated but also naturally faded, creating a rich vintage look. My picture does not do them justice, but take a gander at the beautiful picture of the colors from M2F's Spring Line above. As far as price goes, they're reasonable for a sustainable fashion jean at around $129. Look for M2F's Spring Line to start appearing as Winter fades away. The pastel color lineup will be a welcome light note. The Spring Look Book can be found at Made to Fade's website.